With up to 70% of drain blockages in commercial kitchens caused by a build up of Fat, Oil and Grease (FOG) the need for effective grease management is vital for any commercial catering operation. Buzz Catering Supplies work with many of Britain's leading pubs, restaurants, hotels and commercial caterers to manage the problem of grease, keeping drainage systems operational and buildings compliant. 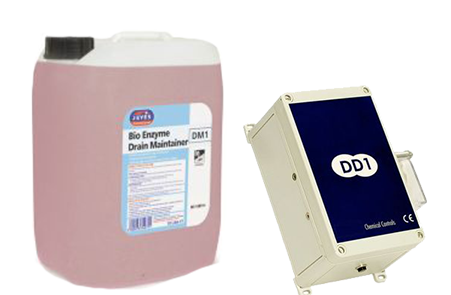 Easy to install and maintain, Bio Enzyme Drain Cleaner is a biological drain maintenance system designed to work with our DD1 dosing pump, a highly concentrated active bio-enzymatic fluid specifically formulated to degrade grease, fats and oils found in commercial kitchen drains. Our Bio-enzyme cleaner is cost-effective and can be used as either a grease trap, or as a standalone drain maintenance system to help operators meet regulations and maintain drains. Enzymes are biochemical digesters. Enzymes work by breaking apart large complex compounds (substrates) into smaller, more readily absorbed nutrients that the bacteria can absorb. Each Enzyme (known as a key) is designed to unlock and break down a specific food source. So depending on what you need to break down, you need a specific bacteria to produce that enzyme. Why do I need to use Enzymes? With today's modern industry using harsh cleaning chemicals, high temperatures and speed of production most drains and treatment plants are at full capacity, so natural enzymes need a helping hand to cope with the high demand placed on them. Jeyes Professional have blended a microbial range of products to help quickly break down all types of organic waste and odour. 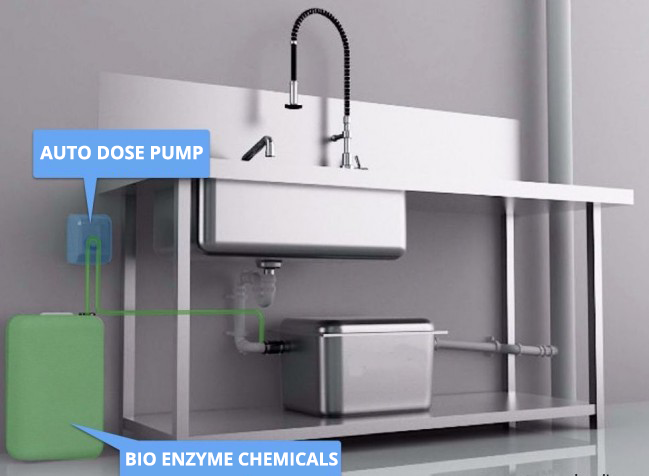 Combined with the automatic dosing pump, a daily dose is delivered into the waste system. Aids in achieving legal obligations to prevent fats being released into the sewage system.